Sorry for this thing comes in a little late since I amtrying to install an after market backup camera on my 2014 C250 sedan in 2017. As you all know, 2012-2014 W204 will either come with Audio20 (5.8” screen) or Command (7” screen) if you had paid more. For the owners ofAudio 20, there will be no engineering menu option for backup camera like thepre facelift w204 from 2009-2011. So you can’t just install a backup camera tothe back of the head unit. Someone hadpurchased a complete set of Command and replace the Audio 20 (do a search youwill find the post). However, theaddition cooling ducts and the completed list is way too expensive. Sotherefore, I decided to go with something more obtainable. I had my friend got this kit for me in Asia.So, I didn’t expect too much. 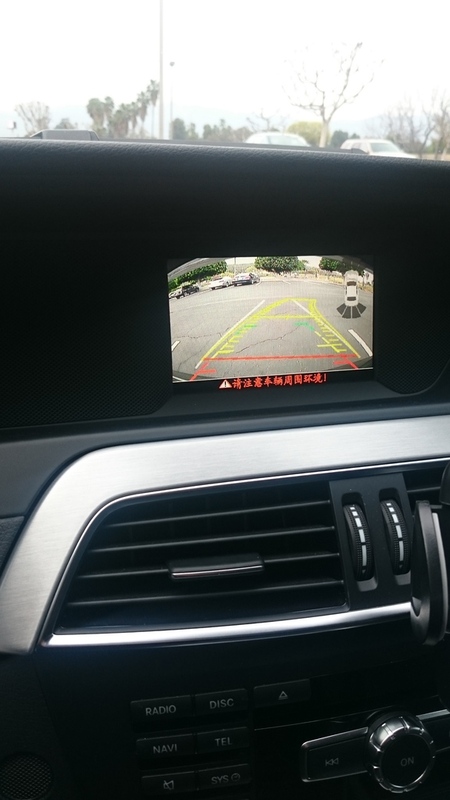 There are similar products on the market if youwant to add backup camera to your facelift W204. All it is is a media interfacebox that can work with your Audio 20. Depends on what you are buying, you canget typical features such as backup camera, parking sensors, front camera, DVDplayer, and Navi. Now here for the Navi, if you have becker map pre wired, youcan just buy a unit and insert it into the glove box. The navigation integratedwith your speedometer. It works fine, but slow. In 2017, I assume everyone isusing your phone with google map. It re-routes faster than you can think of. For me, all I need is a backup camera to helpwith street parking. I didn’t want DVD, front camera or parking sensor etc. My kit was quite well built with factoryfitted harness; no wiring cutting; no tapping into fuses or backup lights; screenshows when put in reverse; and guidelines turn with steering wheel. I suggest buyingsimilar products on Ebay, Carnavi-Tech, and Car-solutions because they seem togive you English and better product. If you want the same kit as I do which is onlya backup camera, I can help you out. Here is a general installation guide and I have somepictures attached with it. Backup camera kit: media interface box, harness, backupcamera, misc wiring. Tools: Torx screwdriver, small torx screw socket with small ratchetsocket wrench, painter tape, dash removal kit with a long pick, wire splicer,flashlight, and a lot of patient. Find covers to protect your steering wheels and shiftknob. 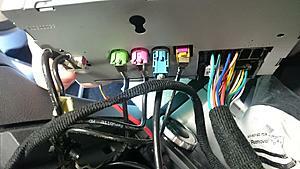 Use painter tape to protect the side body of the head unit. Remove the dash trim is very straight forward. Thereare plenty of youtube videos that show that. Here is one. The key is the little two tabs hiding behind the centervents. All you need is to find a way to pull the tab inward to let the trim tocome out. You can use a pick like the videos show. I was lucky to have a longstick with a sharp end. I inserted the stick into the hole and bend the tabinward while I am pulling the trim out. Once the trim is out, disconnect the emergency lightplug, remove the black plastic trim deck. Loosen the two screws on top of your head unit, this isa little tricky which video doesn’t say much. 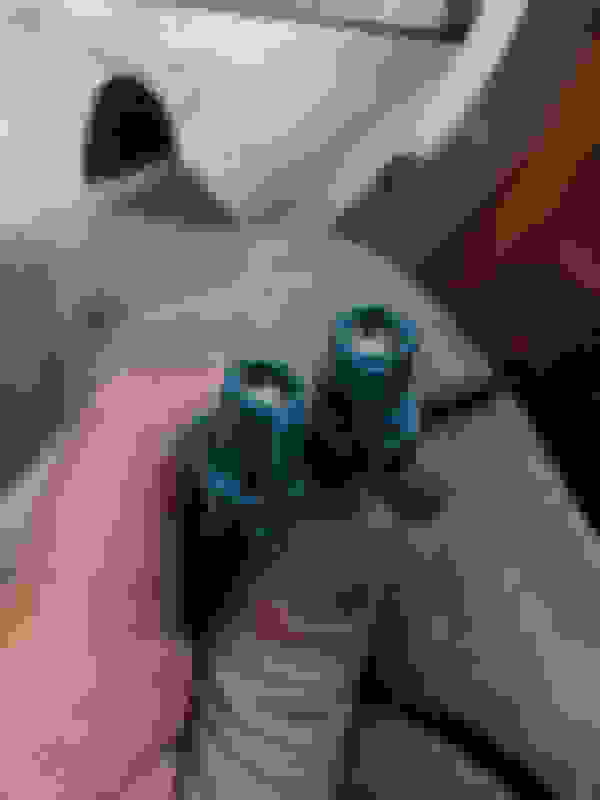 Here, you use the small torxscrew socket with small ratchet socket wrench. Technically, all you need is loosenthe screw almost all the way out with the last coupe threads left and stop, usea Philips screw driver and push the metal holder down (you can use one heavytap and the holder will drop down vertically itself). 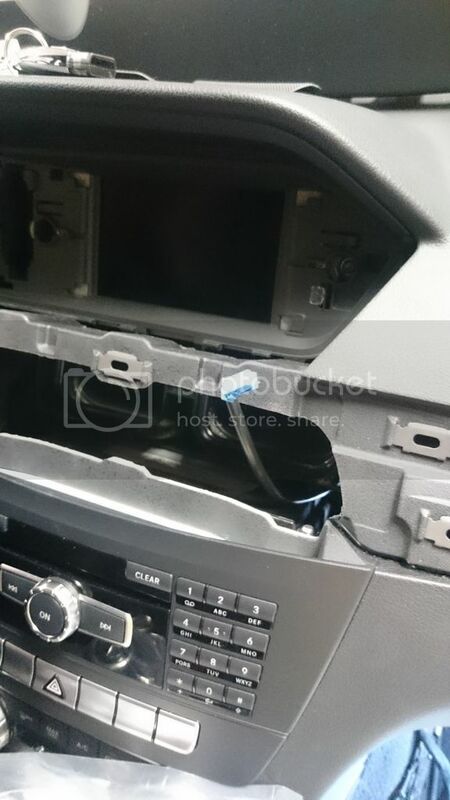 The holders on both sideslock the head unit in place. 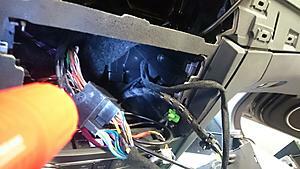 When you reinstalling it, you will pull the screwup which will drag the holder up and lock the head unit in position. German engineeringis over engineering, I don’t know why they make it so complicated. 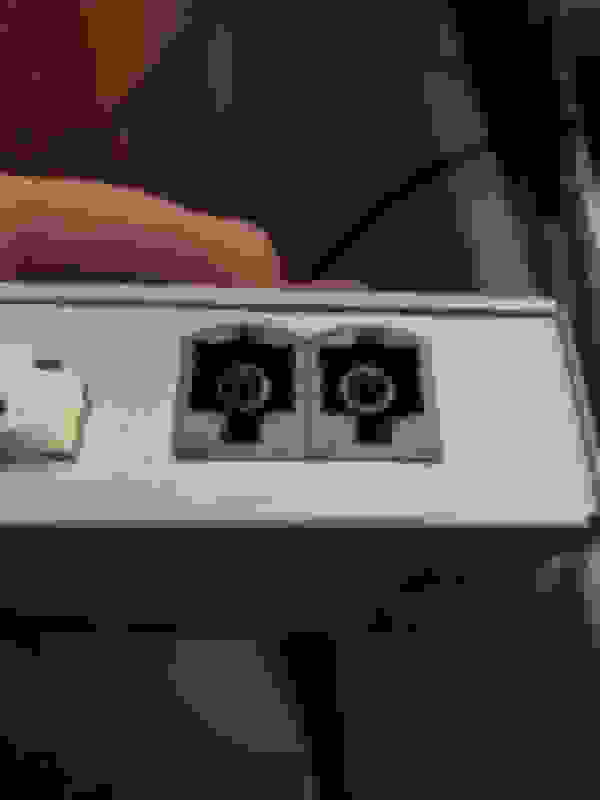 Then, you pull out the head unit and remove the red tabconnector on the right side. 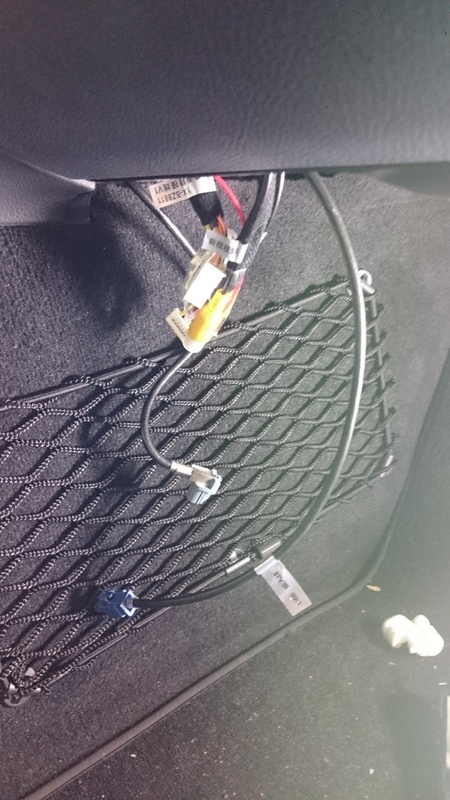 (Try to remember how the harness and the mess ofwires sit behind the head unit, pull the unit out slowly so you can see it.This will help step 16). This step is what I hated the most is to remove thewire connectors behind. I have big fingers which make it a tough job for me. Every kit will be a little different. For mine, justremove the main power harness and the grey plug. Connecteverything per your kit’s instruction. 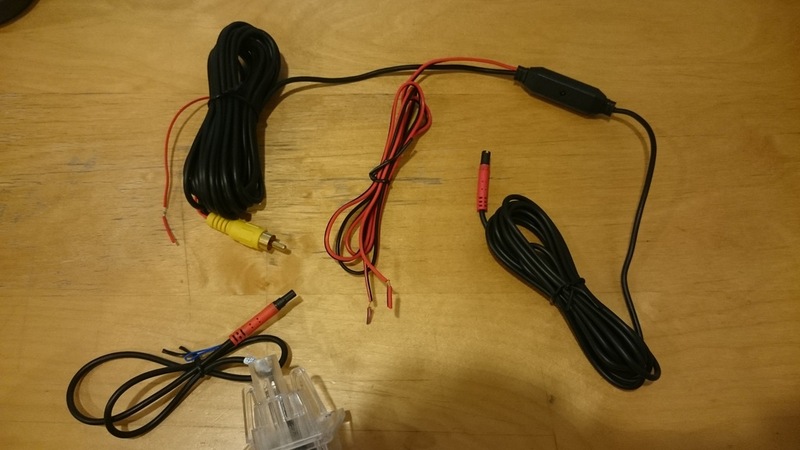 My kit only requires me to plug thecables to the box, connects the yellow avi wire, and connects one power wire tothe camera. Makesure you test out the camera here with everything connected before you do therest so you don’t waste your time. ThenI run all the wires through the cooling vent duct near the passenger footwell. Forthe media box, I just mount it to the plastic panel underneath the glove boxand sandwich it inside. 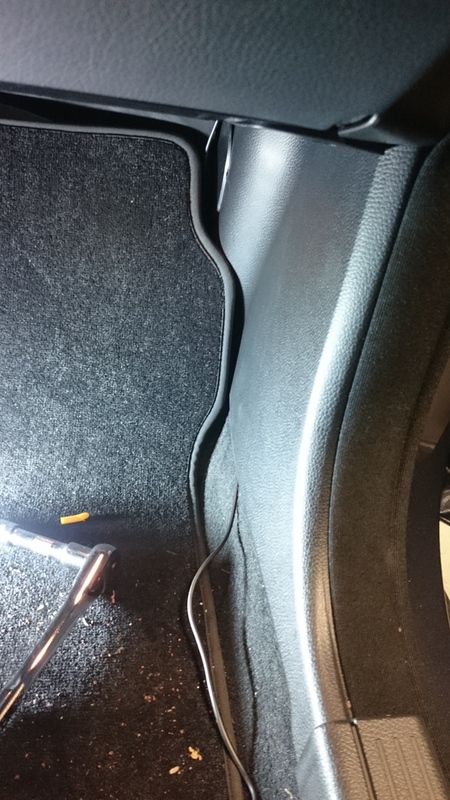 Runthe wire under the door sill to the rear seat. Avoid running the wire at thetop sill because I heard people got hurt by the wire when side air bagsinflate. Onceyou get to this point, the rest is straight forward and just follow this video. One trick is I fed the wire through the sideof the seat, they are just foam in there and you need to force it through, aflashlight on the other side will help. Removethe silver trim above the license plate is hard. If you squeeze the tab frominside, it may be a little easier. You must put painter tab around the trim onyour trunk or you will scratch the car when the silver trim is out. 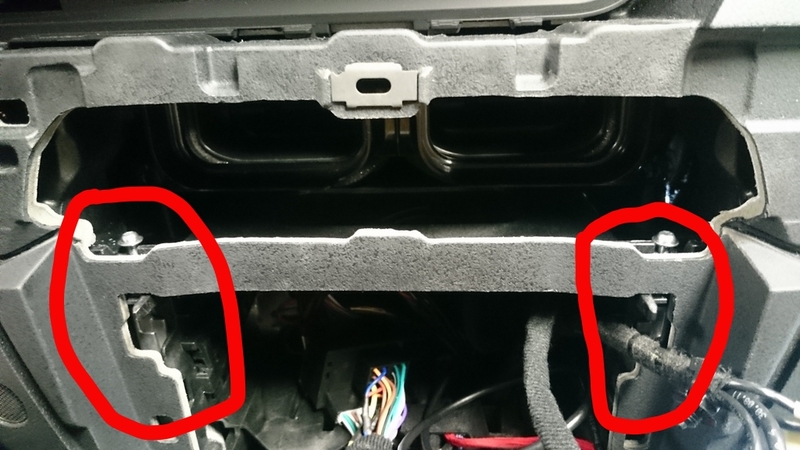 Also,installing the head unit back is hard because there is very little room insidebehind the head unit. You will need to try several times until the head unit isback to the position. See step 6. Asalways, be patient and do it slow. If you need help, we are here to help. Don’tforce it and rush the job or things may break. Also check for other typical maintenance guide. Interested in doing this. How much? I've done this too, works great! I paid $360 for the Chinese hardware and $110 for the install at BestBuy. My kit was about $150 if I remember correctly and I installed it myself. I can probably help you to get it if you need a set. I drilled a 1 1/4 inch hole on the inside wall of the glovebox and the control box is now in the glovebox. I threaded the OEM square connector that's on the back of the COMAND unit through a small space on the passenger side of the COMAND cavity and now the square connection between the OEM and the kit sits in a little hollowed out space just inside of the plastic sidepiece on the centre console (inner wall of the passenger footwell). The whole wiring harness from the kit sits there. 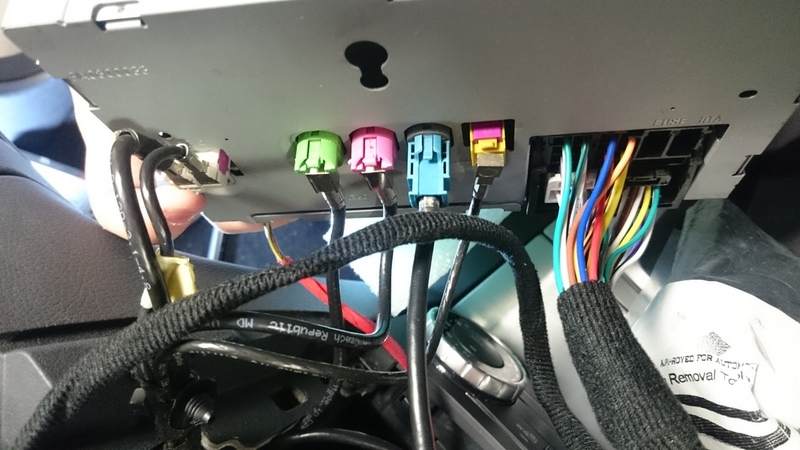 The only connector that's in the COMAND cavity is the square connector from the kit harness that now connects to the back of the head unit. That's the only way I could get the head unit all the way back into it's cavity. The camera (Aerowerkz) works perfectly. Better than I expected--video is high quality, has good sensitivity in low light conditions and I have the OEM guidelines on the screen! Just like factory!! I spent a total of $175 for parts and did install myself (because I'm cheap). I got the chinese parts from ebay. 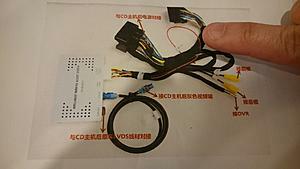 Interface kit = $139 (search "C Class W204 NTG4.5 iPas Parking Camera Interface "). Camera = $36 (search "Rear View Camera W204 Trunk Handle"). I went with a trunk handle camera because I like its low profile and it is (nearly) centered. It looks great after install. The interface kit I got is nice because it has dip switches you can change the language to english, and it has up to 4 video inputs with ability to do 360degrees if you are so inclined and ambitious enough to install more cameras. The install was not easy and took two evenings to complete. Shinjyo's directions proved very helpful, especially the part about protecting the trunk lid with tape. The hardest part for me was reinserting the head unit after I had the interface plugged in because the connector is so large (mostly wasted space) that there is very little room to stuff it back in. Sorry to hear. Winter is here for us, plenty of snow and cold but the backup camera is hanging in there. I was unaware there are US made parts. Curious, what part failed for you, the camera itself or the interface box? I'm doing the installation today. 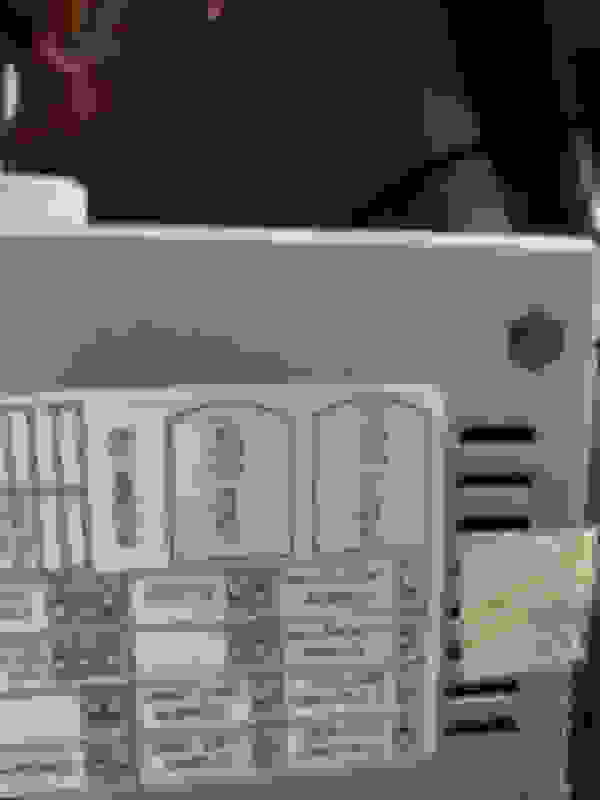 All was fine, i tried the camera with my module : working fine. Then i tried to get back radio unit: it's clearly impossible. It's been 5 hours, and i still can get it back to place !! I'm depressed. I tried every position. 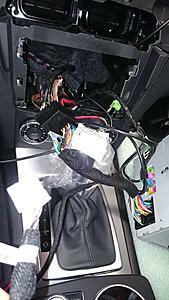 Can someone help to get my radio back in ? Thank you ! Look at my post #5. It explains how I got around the same problem that you're having. Thank you but i don't want to drill anything on my car. The only thing i have in command unit is my module quadlock connector adaptator. 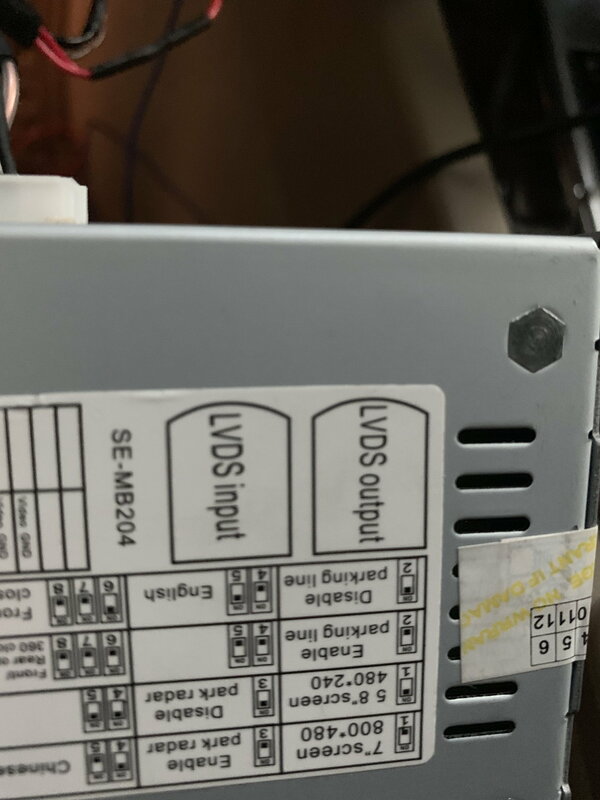 I'm trying to install it below radio unit. Unfortunately, adaptator's cable is too small, so when i try push back my radio, the module quadlock connector gets up from his place. It's been 5 hours i'm triyng to get it back. I'm depressed right now, because i'm really stuck. it's ok. Finally i took my car to a professionnal. He did the job in less than an hour for 50€. This was the better idea i think, because i took more than 6h with no results. My problem is to remove the silver trim above the numberplate. I removed the 4 screw like in the video but silver trim isn't coming out ! it'e been a while since I've done it and I've traded in the car so i no longer have it to refer to, but IIRC there are 2 plastic clips that also hold it in place. The clips are accessed through oval holes on the inside of the back face of the trunk. Reach through the holes in the trunk and if you feel the clips sticking up, squeeze the sides of the clips so they fall through and you can then remove that piece. Hi I had the trim off last weekend on my PFI w204, remove the 4 screws and then insert plastic tools like device between the trim and bodywork then gently pry there are from memory 4 plastic clips which along with the screws hold the trim in place. Just pops off with small prying. I have a plastic small leaver set for this job. I'm not exactly in the same place it appears on my screen. Maybe because camera is a bit on the right, not in center of the car ? is possible some information if you still remember something? how did you connect the camera? I took the same kit but it does not start! I sold my MB since a while, but I had the Best Buy guys install everything. Sorry, I can't help more. I saw that is possible also install 360° cameras on facelift W204 with Audio20. Did anyone try this? Thanks. This is what my kit came with. Am I supposed to unplug one from the head unit to plug into the module? 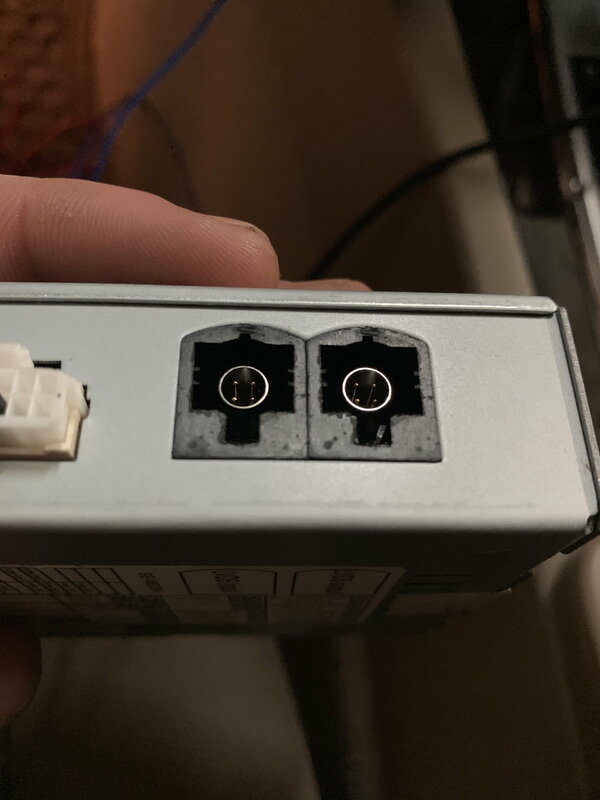 so I need to connect the screen cable to the module but it covers the other plug. Does anyone know the name of the cable so I can get an extension? On the back of the unit which cable is the Video cable? Yellow?? I have a camera and everything a fakra cable but I don't know where to install video cable. I see green, pink, light blue and yellow cable in the back?? ?